Took the 86 took the track. I figured it would run around a 9.5 in the 1/8th. Stock 5.0, AOD with shift kit (supposedly, it shifts firm? ), and 3:73 gears. Car has smog pump delete, e-fan, ford racing shorty headers, mac pro-chamber, and 2.5" flow master cat back. 660ft - 10.611 @ 73.89 mph. Obviously, the 60ft times are murdering the et. I got a few things planned before the next outing. How much do you think it will help? What does you think it will run by doing the following 4 things? 3. Bumping the timing up to around 13 degrees? Think I can hope for low 9's? Figure stick tire should get me down to at least a 2.2(?) 60 foot, and drop my et down to at least a 9.8. Hoping for a .2 each from the short belt, timing, and intake and tb. I'm going to set my sights high with a 9.2 if weather is good! Are you loading it up against the converter? I've always had a little better luck mashing the gas off idle. Those tight converters usually flash a little higher unloaded. Tires are a must though and will make the most difference. Unhook the front sway bar if you haven't already. Tried both. Mashing the throttle was a no no. Bringing it up on the converter and rolling into throttle slowly was the fastest pass. Of course with sticky tires that will probably change. With a 2.999 sixty it's obviously all about the tires. Nothing else will make a difference till that is addressed. When I first switched from street tires to drag radials my short times dropped from 2.3's to 1.8's right away without changing anything else. I don't know how well the short sidewall drag radials work, but if it was me I'd want to get a set of DRs mounted on 15 inch wheels just for track use. I also gather this was your first trip to the track so you will find a lot of improvement comes naturally as you get more seat time. We're not fast racers, we're more what's known as half fast racers. First time with this car, and at this track. I thought about some 15s as well, but I'm going for sort of a sleeper look. Last time I took my 86 (5spd) to the strip, my best 60' was 2.12 on street tires at 25psi no burnout. Practicing launch will help a lot. IIRC correctly my 1/8 time was 9.2-9.3 range at 75mph. 270k mile untouched 86 motor with E6 heads, stock headers, off road H-pipe, Flowmasters, Underdrives, E-fan, smog pump delete and 3.27 gears. Add timing and skip everything else. They wont let the street tire cars on the sticky portion of the drag (the groove), otherwise street tires would of probably done just dandy. I don't need drag radials for traction necessarily, I just needed them to be able to get where the traction is. It's going to rain Friday so wont be able to take it to the track then, but hopefully the following Friday. I’d find some slicks ..... or a different track. Last edited by erratic50; 04-16-2019 at 11:30 AM. I think these tires will make it dead hook now. They changed the weather, Friday is looking sunny. I'm on call. But if I can get somebody to cover me for a few hours and I can find 2 extra wheels to mount the mt's I'm going to hit up the track. I'm going to hope for lower 9s. I got a good laugh out of this. Just as I can't understand why anyone would post pics of their food online, my wife can't see why anyone would post pics of their tires. Here's how my progression went. 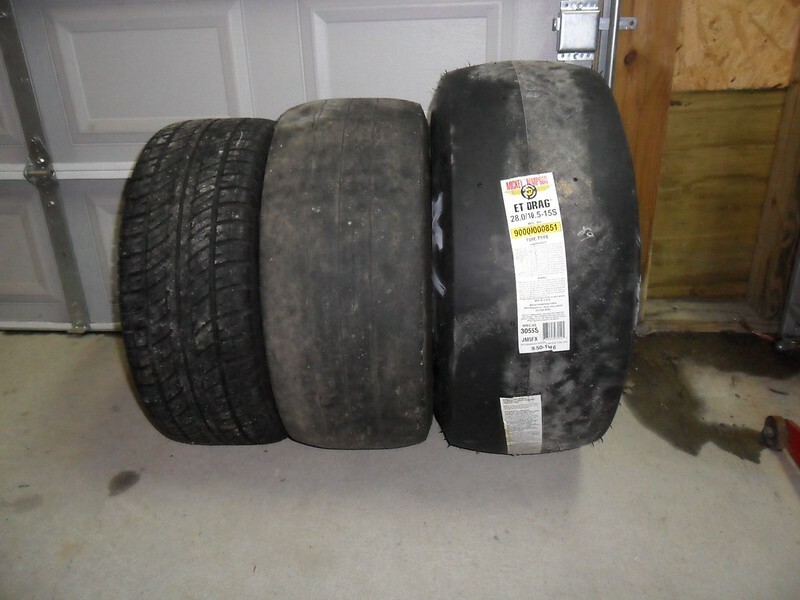 From left to right, street tires, track tires, serious track tires. On a car with any power at all street tires just don't cut it no matter where the track lets you run. In my opinion street tires have even less traction on the track than they do on the street, they just aren't designed for that duty. Where I used to run (Beaver Springs) they had what they called the Friday night street fights featuring street legal cars without restriction on running street tires in the groove. They did not however require street tires and just about everybody who showed up more than a couple times ran some type of racing tire. But then we were bracket racing and one thing you most certainly won't get on street tires is any kind of consistency. With the sticky tires and the mods you mentioned, I believe 9.0's are very achievable. My '86 LX 5.0 hatch went 9.4s - 9.5s on street tires. It was all stock except for the o/r H-pipe and Flowmaster American Thunder cat-back. Currently with my 5 speed '93 coupe I'm running 8.3's with a factory sealed longblock. Though it is a 5-speed with 4.10's, full suspension, and 26x10.5 bias ply MT ET Street R's. It also weighs in a little over 2800 lbs with full interior. Are you racing at Bonne Terre? I can't wait to take my pile there. I used to sand drag there before it was asphalt. I've got to work this weekend, but I wish I could. Picked up a cheap set of tribars to mount the drag radials on. Weather is looking pretty good for Friday. Here's to hoping for 9.5 or better! I think the lightest ford wheel was the star fish wheels, they were like 17. I think these are around 20ish lbs. I do want to get this car into the high 8's, but I don't want to get to crazy with it. Thinking about grabbing a coupe and going all out poor mans race car on it. I would look for a cheap explorer motor to swap the heads and intake. With that and sticky tires you'll get a low 9 and maybe 8's. Last edited by gmatt; 04-19-2019 at 02:52 PM. 5. Third I just nailed it off the line to flash the converter, it spun a little of the line, and and spun a little when I bumped it into 2nd... and I just finished the run in 2nd. 3rd when I did the 1-2 shuffle I guess I didn't leave it in 2nd long enough so I had to bump it into 2nd again. Screwed up the run and ran a 9.6. The car has more in it. I need to figure out where to shift it, where it likes the timing... and a few other little things and I thin it has some low 9s in it... and i dont think hitting high 8s this season is out of the question. I wish it was a 5 speed, but it will be soon enough.